I've said that before, haven't I? I've tried to close the shutters on this space several times, albeit never very successfully. At any rate, you've probably noticed it's been pretty quiet here for awhile now. This past year was a bit of a rough one in our homeschool. Don't get me wrong – it was successful in many ways. We finished 36 AO weeks and did choir and piano and swimming and church activities and some fun field trips and a little co-op with friends. I got to go to a Charlotte Mason conference up in the DC area and a couple of local Circe Institute events. I made an attempt at starting a Charlotte Mason support group in my local area. My children have grown as people in some delightful ways. But this Mama has been tired this past year. We've been at this homeschooling gig pretty intentionally for more than six years now, with some preschool work thrown in even before that. Assuming I see my youngest all the way through to high school graduation, we have another 11 years to go. This is a long-haul proposition y'all, and I'm smack dab in the middle of it. Far enough in that the newbie idealism has pretty well worn off, long enough still to go that the end is not yet in sight. I came dangerously close to burning out last year. And I spent some time this summer considering the reasons why that is and what I can do to remedy it. I finally realized what the problem was: I had become a "homeschooler" rather than a "person who homeschools". (Thanks to whoever-it-was over on Facebook that put these words to what I was already thinking.) Nearly all of my time, thought, and identity was wrapped up in homeschooling my children and things related – reading educational books and books that we would someday be reading for school, spending time with homeschooling activities and groups, going to homeschooling conferences and events, listening to homeschooling podcasts and reading homeschooling blogs and yes…even writing one myself. I had lost track of the person I am in my own right. I needed to find her again. 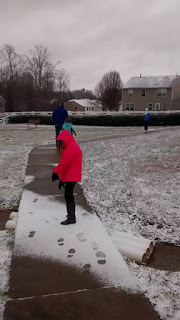 Now fear not – I didn't give in to the temptation of the Big Yellow Bus (although true confession: some days that's because it comes through my neighborhood at 6:30 in the morning and I cannot imagine having my crew up and moving and out the door that early every.single.morning. Ahem.) 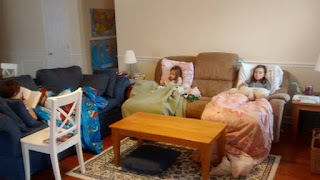 We are still homeschooling, which does mean a fair amount of my time is still wrapped up in homeschooling related tasks and activities. I am still a moderator at the AmblesideOnline forums and attend some (but not all) local homeschooling events. But I have also expanded my horizons. I am reading and listening more widely - things that I really *want* to read and hear and know rather than what I feel I *should*. I'm very involved with various church activities, and recently started singing with the worship team – a side of myself that has lain dormant for years and years. And I'm writing again. Apparently I can't NOT write. But I'm not writing about homeschooling. And that's why I'm closing the shutters on this space. But this isn't the end my friends! While this space is closing down (archives will remain here for reference), I have spent some time over the past few months setting up a new space over at Faithfully Ordinary. My hope is to write out of the overflow of what I am reading, thinking, and learning and explore how those things intersect with ordinary life – whatever your ordinary might be, homeschooling mama or not. I want to write the things that I want to read – the things that will encourage me or challenge me and send me back to my daily life refreshed and renewed. And I would love for you to join me! Hope to see you on the other side, my friends. So on Friday, the Feast of the Epiphany, the Three Magi safely made it to the fireplace mantle to deliver their gifts to the Baby Jesus, Miss Elizabeth found the quarter in her piece of the Galette des Rois, and just for good measure an ice storm topped off with a dusting of snow passed through. But with all of that, Christmas break has ended. Our Christmas break has been a delightful couple of weeks of gifting, and feasting, and reading, and friends, and crafting, and movies, and staying up late, and sleeping in, and playing in pajamas well into the morning and occasionally past lunchtime. But tomorrow, things need to go back to 'normal'. We will begin school again, picking back up the last few weeks of the term before exams and starting fresh with a new pile of books. On Tuesday, the children resume their swimming lessons and choir practices, and on Wednesday we will meet with friends again for co-op. We're not easing back in, we're diving back in. On the one hand, we're ready for it. After two+ solid weeks off, preceded by the flu and a slow limp to the finish line, it feels like it's been a long time since we've had a day in which we followed a normal routine. The crankiness that is creeping in around the edges is telling me it's time to reclaim it. On the other hand, I feel overwhelmed by the thought of trying to get that ball rolling again. Inertia. An object at rest wants to stay at rest…. Oh how I want to stay at rest. Sloth is a vice I wrestle with every.single.day. I need a little something to kick-start me back into action, to help me to gladly go forth and resume the work He has given me to do. Maybe I'm not the only one? I suspect perhaps that I am not. I can't offer you a package bundle of resources and checklists that guarantee to help you start the New Year with a bang. I can't even offer you a blogpost in which I attempt to weave these wise words I have gleaned from others into a coherent whole. That said, these are a few of the words that have been feeding my soul and strengthening my heart and helping me combat my propensity toward sloth this week as I prepare to shift gears and begin "normal" life again after the slower rhythm of these past weeks. A new year with all its possibility spreads out before me. Tomorrow morning I will get up. I will push back the voices that will whisper that it's just too hard, pray this prayer, and trust in His grace and goodness and strength to do my 'daily bit'. Who's with me? So…yesterday was the *best of* 2016. Today, I attempt to share my reading plans for 2017. It's a little tricky because I don't really plan out my reading in great detail. I used to, and doing so sucked all the joy out of reading for me. So pretty much the way it works is that I read a title from each of those categories, rotating through them according to what I feel like when I get a few moments here and there to sit down and read. When I finish one book, I choose another in that category – whatever sort of strikes my fancy at the time. No particular time limits or schedules or writing of long lists. I do try to make sure at least one of them is lighter in nature so I don't end up with huge masses of dense, heavy reading and nothing to dig into when I'm tired in the evening. It's a pretty simple system that allows me freedom to pick and choose, while helping me stay focused and intentional with my precious bits of reading time. 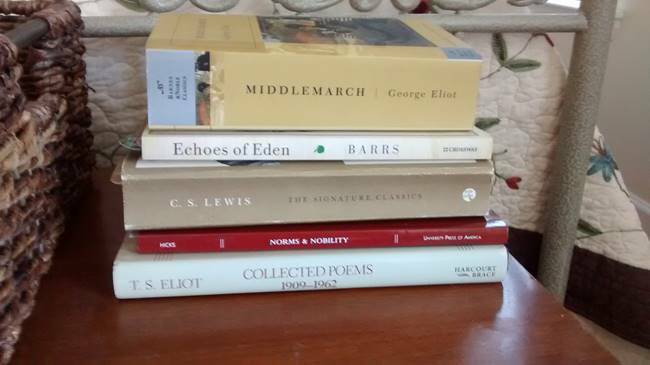 You can see my basic categories at work there: Middlemarch is my fiction pick, Echoes of Eden the nonfiction, CS Lewis' Mere Christianity (one of the titles in the big "Signature Classics" collection you see there) my theological pick, Norms and Nobility the educational one, and TS Eliot's poetry. My husband and I are between books right now, but will probably continue our ongoing Jane Austen project (Persuasion?). 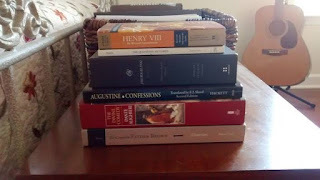 And devotionally, I am using The Ancient Christian Devotional which pairs the Sunday lectionary readings for each week with relevant quotes from the church fathers, along with a slow reading of the Gospels, and prayer resources from The Book of Common Prayer. I fully expect the devotional readings, the TS Eliot poetry, and Norms and Nobility to take all year. But as I finish books from the other categories I have lots of choices. Some of those are pre-reading for future AO Years. Some are just because. There will most definitely be some Shakespeare, and hopefully at least one or two of the book discussion titles over on the AO Forum. 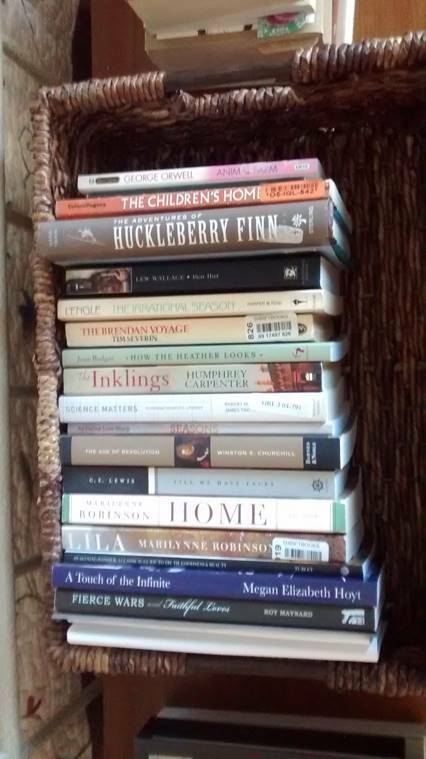 I also have the stack of my "12 Days of Christmas" books from my husband. (Yes, he bought me a book for every one of the 12 Days of Christmas. He's pretty amazing, isn't he?) Pictured here are only days 1-6…there are more to come! Not to mention things that are trickling in from my Amazon gift card purchases…. So very much to choose from! And who knows what else will come my way before the end of the year? 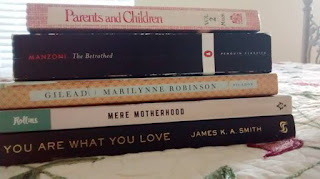 Last year two of my favorites were Mere Motherhood and You Are What You Love which weren't even published or on my radar until later in the year. J I won't read all of these, of course. But there is so much possibility here. I'm looking forward to a good Year in Books. What are your reading hopes, plans, and dreams for this coming year? So…the stats. I actually read and finished 43 books this year, not counting the Bible or books read to/with the children for school or otherwise. I was actually shocked by that, because I have felt so often this year that I *just don't read as much as I used to* for a wide variety of reasons. But that's only 6 short of my 2015 tally. Granted, I read more light fiction this year that I have typically read in years past, but still pretty respectable. I guess I'm squeezing more reading in there than I thought I was. 1. 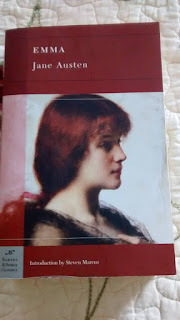 Parents and Children (Charlotte Mason) – This is Charlotte Mason's second volume, and was one of the two that I hadn't yet read (Volume 5 is my last holdout. Hoping to tackle that one this year.) I wrote a review of this book here. 2. Mere Motherhood (Cindy Rollins) – Delightful and Profound. Read my review here. 3. You Are What You Love (James KA Smith) – If you read along with Desiring the Kingdom a couple years ago and liked Smith's ideas but not his delivery so much, this is the book for you. The basic premise is the same as Desiring the Kingdom, but the presentation and application is much more accessible for ordinary, not-academic-philosophers. My husband is actually reading and enjoying this one too. In a nutshell, this is an apologetic for why liturgy matters – both in the formal worship setting, as well as informally in the habits and everyday practices of our lives. These things form and shape us more than we realize. It's worth taking the time to consider what kind of people our habits – liturgies – are shaping us into. 4. 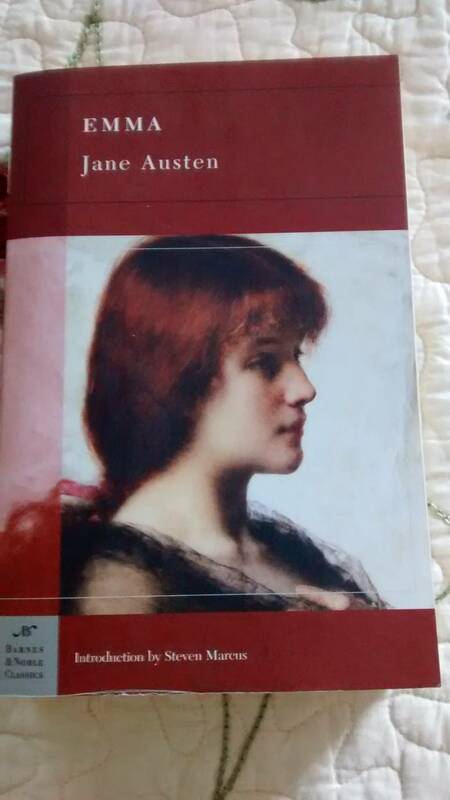 I Promessi Sposi (The Betrothed) (Alessandro Manzoni) – This is one of the assigned literature selections in AO Year 8, and one of the titles selected for the Book Discussion group over on the AO Forum this past year. It is *the* novel of Italy and an epic in every sense of the word – so much food for thought and insight into human nature all wrapped up in a compelling story. 5. Gilead (Marilynne Robinson) – This is an author I've heard mentioned many times in the literary circles I frequent, and I'm so glad I finally gave her a try. So, so good. I have her others in my 'to be read' basket, waiting for just the right moment. 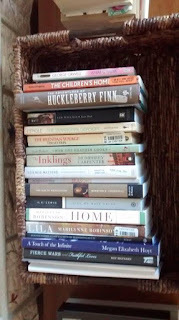 And a few honorable mentions, just because I can never pick just 5…. 1. The Tempest (Shakespeare) – I've dipped in to a fair amount of Shakespeare this year as my kids have reached the age that we have started to study Shakespeare for school and I (and they!) am loving it. I haven't studied this one with the kids yet, but it was far and away my favorite Shakespeare that I have encountered yet. 2. 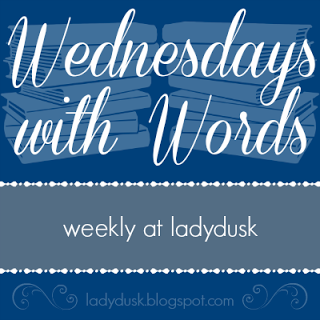 Surprised by Oxford (Carolyn Weber) – So this was a re-read. For the third or fourth time. I loved it every bit as much as the first couple of times, but since it has made a previous best book of the year list, I figured maybe I ought to bump it down? Re-reading it made me wish I had taken an English degree rather than an Elementary Education one, made me want to travel to England and read more CS Lewis (which I have been! ), and inspired me to finally finish Paradise Lost, which was worth the effort. 3. Surprised by Joy (CS Lewis) – I've read a fair bit of CS Lewis this year, and this was my favorite of the lot. So fascinating…I loved reading his story. 4. Caring for Words in a Culture of Lies (Marilyn Chandler McEntyre) – Recommended by a friend from church. 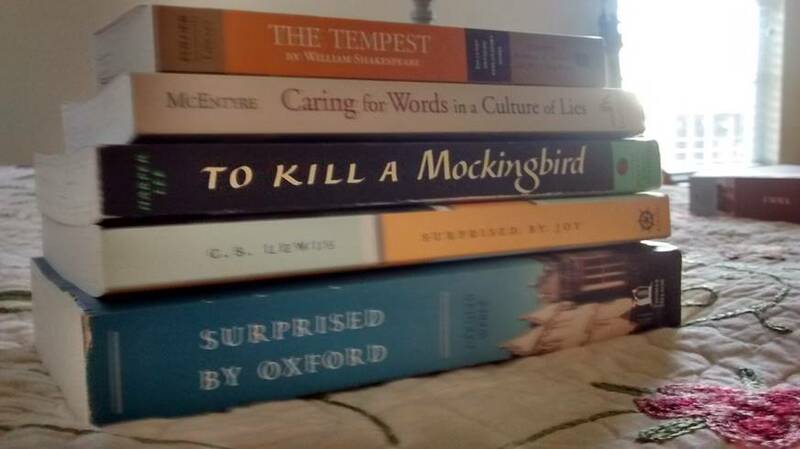 It is a series of essays on using Words well written by a literature professor. Much food for thought, and a book I will revisit. 5. To Kill a Mockingbird (Harper Lee) – Beautiful picture of what it means to live with integrity in a hostile culture. I read this back in high school, but it was very meaningful to revisit it as a 30-something adult with that much more experience of the world. What did you read this year? Highlights? Lowlights? So many times over the past few weeks I have tried to sit down and write, and just found that the words won't come. The thoughts are there swirling around in my head, but the words just won't come. So...I think it's time to step back from this space for a spell and let those thoughts percolate a bit more. 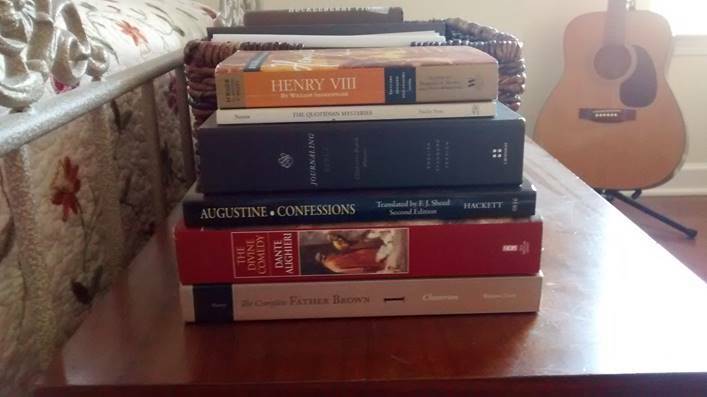 For today, I leave you with an Advent reflection I originally posted December 22, 2014, and I will probably pop in some time around New Years to share my Best Books of 2016, but otherwise...I will be back when the words are ready, my friends. This year's Advent season has been kind of different – unique – mostly in a good way. Part of it is borne out of the fact that I decided to wait for most of the 'celebratory' aspects of Christmas – the decorating, the baking, the gift wrapping, the music, the guests - until…well…Christmas. We are all off of work and school that week between Christmas and New Years and will actually have time to savor and enjoy those activities. I find that now I'm actually looking forward it rather than dreading one (or two, or three, or four) more thing to cram in around my husband's busy work schedule, the kids' swimming lessons, and moving house (which is how we spent the first three weeks of December). 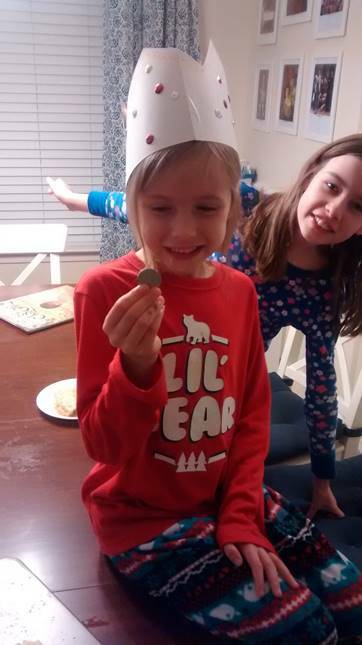 Part of it has been seeing the kids embrace our Advent devotional traditions as their own. They asked for weeks ahead of time if we were going to listen to the Messiah again this year. They are active participators in our nightly Jesse Tree readings. They listen. They ask questions. All those years of trying to establish these traditions when they were all little and it seemed to be a waste of time because they were too wiggly and squirmy to get anything out of it? That's totally paying off now that they are a little bit older. Part of it has been that I have been taking the time to do my own personal reflections on Advent, using the devotional guide portion of Bobby Gross' book Living the Christian Year, meditations that have seamlessly tied together with my regular through-the-New-Testament readings, my personal literary reading, and what we've been reading with the children. Those twin themes of Advent - waiting and patience -have been particularly meaningful to me this year. This has been true both on a personal level in my daily battle against discouragement and on a grander level when one starts to think about all the hard, hard things going on all over the world – those things that sometimes make you start to wonder at times if God is still there. And when he shakes his mane, we shall have spring again." The following day, I came to the story of the birth of John the Baptist in my Advent reflections. The thought occurred to me about how very amazing these events must have been to Zechariah and Elizabeth and those around them after 400 years of "silence" - to see God stirring and working again…to see prophecies being fulfilled, to know that they were not forgotten. This birth of John the Baptist was like that first thaw of spring after endless winter in Narnia....Aslan was on the move! The promised Messiah was coming to rescue and to redeem and to save: "Because of the tender mercy of our God, with which the Sunrise from on high will visit us, To shine upon those who sit in darkness and the shadow of death, to guide our feet into the way of peace." (Luke 1:78-79, NASB). "Joy, warm as the joy that shipwrecked sailors feel when they catch sight of land - Poseidon has struck their well-rigged ship on the open sea with gale winds and crushing walls of waves, and only a few escape swimming, struggling out of the frothing surf to reach the shore, their bodies crusted with salt but buoyed up with joy as they plant their feet on solid ground again, spared a deadly fate..."
Waiting and patience…and the joy that comes when that long waiting is over and the thing sought for has come at last. He HAS come to save us, and WILL come again to take us home. We can have hope in the waiting because we know that the joy will come. It is sure and it is certain. "…ceasing to be 'in love' need not mean ceasing to love. Love in this second sense – love as distinct from being 'in love' – is not merely a feeling. It is a deep unity, maintained by the will and deliberately strengthened by habit; reinforced by (in Christian marriages) the grace which both partners ask, and receive from God. They can have this love for each other even at these moments when they do not like each other… 'Being in love' first moved them to promise fidelity: this quieter love enables them to keep the promise." "Let the thrill go – let it die away – go on through that period of death into the quieter interest and happiness that follow – and you will find you are living a world of new thrills all the time." Part 3 – Chapter 6 – "On Christian Marriage"
I read this book years ago, as a college student. I remember enjoying it – I've always been a fan of CS Lewis – but I don't remember now much about what I took away from it. (I actually really wish I still had the same copy I read all those years ago, because I'd love to see now what sections I marked and commented on my first go around, and how it compares to my second go. Alas, that book was lost somewhere in one of our many international moves over the last 15 years.) I am so enjoying reading it again, though. Even though Lewis wrote this somewhere around the time of World War 2, if I'm not mistaken, there has been so much that has just resonated as timely and true in the issues of our modern culture. And that's the mark of a good book, don't you think?